Apprising Ministries has been documenting the sad slide into apostasy of contemporary evangelicalism for some time now. Circa 1997 the sinfully ecumenical neo-liberal cult within the Emerging Church aka the Emergent Church began spreading the cancer of Contemplative Spirituality/Mysticism into the mainstream. One of the results is a growing syncretism and a sappy sentimentality passing as the genuine robust Christian faith. An effete faith advanced by women in men’s pants. Frankly, I think it’s a delusion these men are receiving where they become convinced it’s God’s will for us to set aside doctrinal differences in order to bring the visible church together. As I see it, that’s the underlying philosophy of the Elephant Room 2 that detonated a couple of weeks ago. By now you’re likely aware that ER2 has now mainstreamed T.D. Jakes, who essentially said in ER2 that he was a trinitarian who chooses to express it in the language of a modalist. Then it’s even grown worse; seems if we don’t accept Jakes as a Christian brother, well, apparently it’s because we’re racist. You can find more detail and the link to the video in James MacDonald, Elephant Room 2, And The Race Card? One of the things being missed as ER2 shockwaves hit The Gospel Coalition, Harvest Bible Chapel, and Acts 29 Network is the horrible baggage T.D. Jakes now arrives with within evangelicalism. Jakes called Osteen, hoping to get Lakewood to host a men’s conference. A quick tour turned into an all-day session… Their new bond led Osteen to invite Jakes to preach. 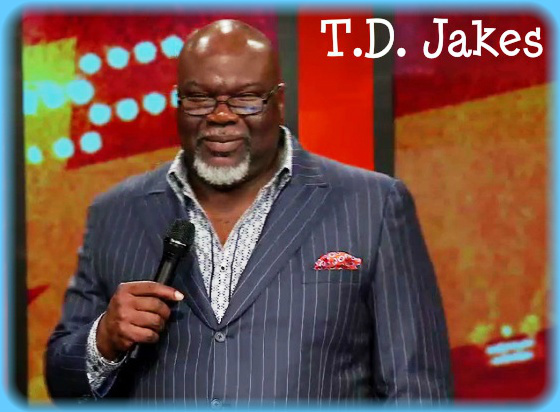 In addition, Jakes’ recent Woman Thou Art Loosed 2011 conference, featuring pastrixes Paula White, Cindy Trimm, and Sheryl Brady, was hosted by the Lakewood Church of fellow Word Faith prosperity preacher Joel Osteen. All of these people are well known within Word Faith circles and regulars on TBN. As I close this out, for now, AM special correspondent Erin Benziger tells us in her Cleaning Up After the Elephants? MacDonald Takes to the Airwaves about a recent offensive the ER2 curator has launched. Benziger reports on an interesting twist now concerning T.D. Jakes and James MacDonald. Fabry brought up the oft-neglected (by MacDonald, anyway) elephant of T.D. Jakes’ prosperity gospel. In this part of the discussion, James MacDonald indicated that a private conversation had taken place (among whom, we do not know, though it is obvious that it was at least allegedly between MacDonald and Jakes). Why anyone would call me a prosperity preacher?